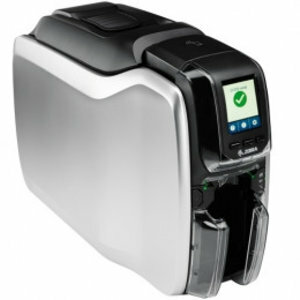 The card printer ZC300 from Zebra convinces from the first moment with its design – and secondly with its quality and performance. It prints single-sided plastic cards, and double-sided with the optional card turning module. Plus, there is a version available which allows users to simultaneously encode magnetic stripes. Every detail of the ZC300 is designed for maximum speed and user-friendliness – such as the practical output doors for removing single cards or the entire stack. Or the lightweight color cassette, which is easily exchanged. The ZC300 input and output trays both hold 100 cards, so that no tray needs to be filled or emptied during the printing process. Its print speed is up to 200 color cards or 900 monochrome cards per hour.